FIFA World Cup 2018 - astrological and astrogeographical data. A profound astrogeographical investigation and interpretation of data should observe the matches played in the World Cup tournament as an exchange of information on emotional, psychological, energetical and other issues between two nations through the morphic resonance field through which the systemical centers (capitals) of the single nations are interacting. Nations exchange information this way during Olympics and World Cup Tournaments in order to stimulate development and learn from each other. So what I suggest is trying to observe the more abstract perspective on the matches, atmospheres, performances, emotionality, mentality and spirituality of the things that happen from an astrological point of view instead of reducing astrology`s function to the prediction of the outcome of matches. The astrogeographical coordinates for the capitals and energetical centers of identification of the two national teams that will play the 2nd semifinal are 11°Pisces plus 12°Leo for Zagreb capital of Croatia and 27°Capricorn and 24°Libra for the english capital London. Mercury the planet of intelligence, tactical cleverness and individual skills in Leo the sign of passion, emotional self-centeredness and impressing others has been the central astrological aspect in support of the team representing Croatia during the tournament. Now that Mercury´s is moving away from the exact conjunction with Zagreb its influence may seem to decrease. Jupiter`s influence can be expected to be particularly strong after he turned direct from 13°Scorpio on 10 July and in nearly exact square to the 12°Leo astrogeographical position of Zagreb. This aspect could find the Croatian team quite exhausted, deprived of the full amount of motivation and under pressure on the night of the semifinals. 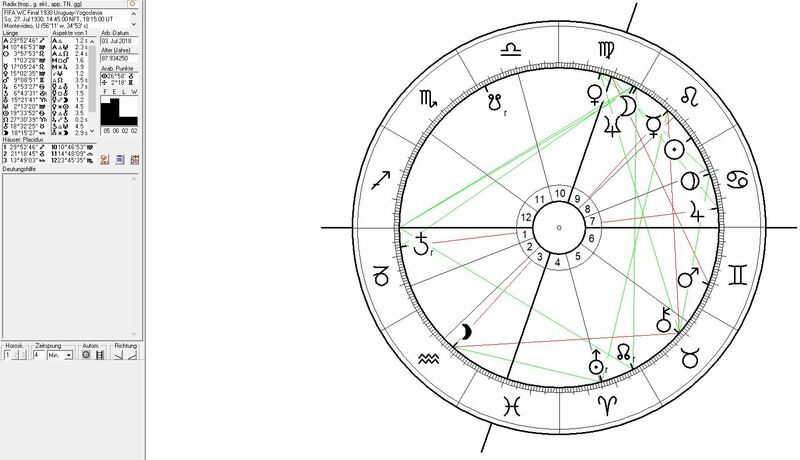 The Sun – Pluto opposition between 19°Cancer and 20°Capricorn approaching the exact square to the 24°Libra astrogeographical position of London is a highly problematic planetary constellation in itself. But because of London`s intense resonance with Capricorn through together with England`s strong cultural affinity with Cancer that constellation may actually not be problematic for the english team as long as nationalist dogma (Pluto) is confronted by the concentration on the sports and the allowance of the self-esteem of the young and talented players instead. As Mercury is to be understood as a factor in support of the croation team the Moon position in Gemini the sign of Merury`s rulership during the first half of the match is to be understood as a hint at a strong performance by the croation team. The Moon`s ingress into Cancer at the beginning of the 2nd half the strongestz astrological resonator of english culture at the beginning of the 2nd half is an indication that the english team could start to feel more grounded and stable in their action gaining or defending a dominance in the midfield. Two days after the Venus ingress in Virgo – the sign of recreation the effects from Venus may include a certain lack of freshness and a hesitation to fully engage in competition. This is also an obvious effect of the responsibility that the single players will be facing in such an important pont in theri careers. Thi Virgo aspect may be understood as particularly favourable for the more experienced croation players esp. superstar Luka Modric born with the Sun in Virgo. The Venus – Uranus trine of the is an espect that could be more easily represented by the multicultural background of the english team players. According to my astrogeographical calculations the astrogeographical resonating degrees of the energetical centers of the national fields of France and Belgium are Paris at 27°Aquarius plus 28° Sagittarius and Brussels at 8°Scorpio + 22°Pisces. The semifinals` match between Belgium and France will be played during a really tight opposition between the Sun at 18°Cancer and Pluto at 20°Capricorn. The Sun as the ruling planet of Leo the sign of french culture confronts Pluto the astrogeographical ruler of Scorpio and resonator of the astrogeographical position of the Belgian capital at 8°Scorpio. It is to be expected that this constellation could be interpretated by the players as a fierceful battle for the supremacy over the center of the pitch (midfield). 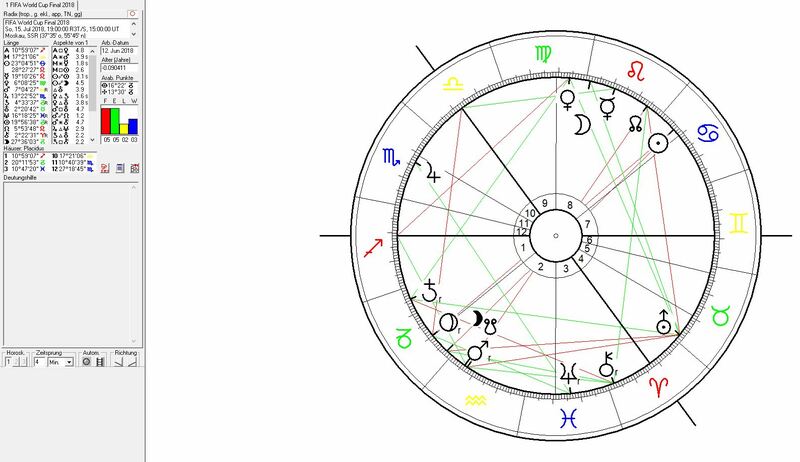 At the same time the Sun will be in a trine to the 2nd astrogeographical position of Brussels at 22°Pisces. This indicates that from an astrogeographical point of view both the Sun as well as Pluto appear to be integrated into the concept of the belgian team at least through its resonance with the national systemical morphic field. The french team can be expected to continue its successful path through the support of Mercury at 15° Leo the sign of french culture supported by an exact sextile from the Moon at 15° Gemini. This constellation could be highly stimulative for the self-esteem, technical performance and reliance of the french team on their technical skills, clever performance and tactical plans. That constellation seems really promising to be highly successful in the first half of the match but as the Moon continues its path approaching the square position to Neptune the euphorical effect of the constellation could cease to be effective. As the ruler of the astrogeographical position of the Belgian capital in Pisces Neptune should be evaluated as an energetical stimulation of the potentials of the beligian team rather than the french. Jupiter at 13°Scorpio conjunct the 8°Scorpio coordinate of Brussels and in a grand trine with Neptune and also the Sun further stimulates the support for the center of the Belgian national field and team in what seems an ideal astrological constellation for Belgium during the tournament. 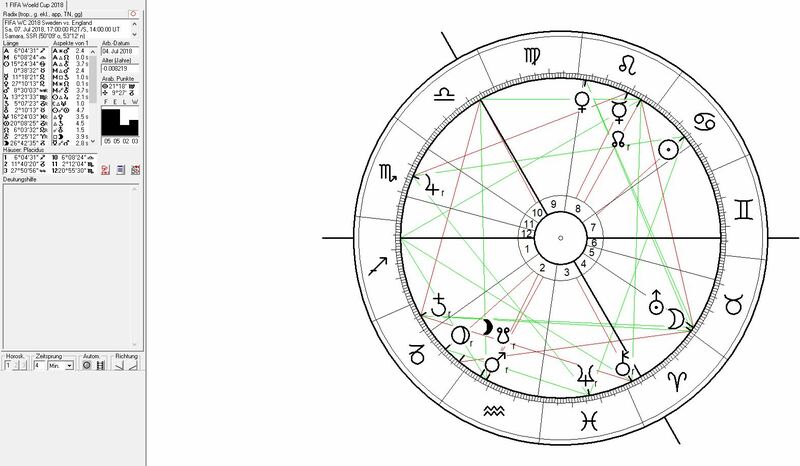 The ingress of Venus into Virgo and into an exact trine to Uranus is an indication of a major energetical change in the final phase of the World Cup. Uranus`s innovative position in Taurus is the factor which explained the surprising events and fresh winds brought into the hierarchy among the participating national teams during the tournament. Venus` shift from Leo into Virgo could transfer the focus from passion and energetical intensity to defensive organisation, control, reason, tactical priorities and sparing ressources. Altogether this change of atmosphere stimulated by Venus could turn out highly positive for the stimulation of discipline especially for the french team and individual players. 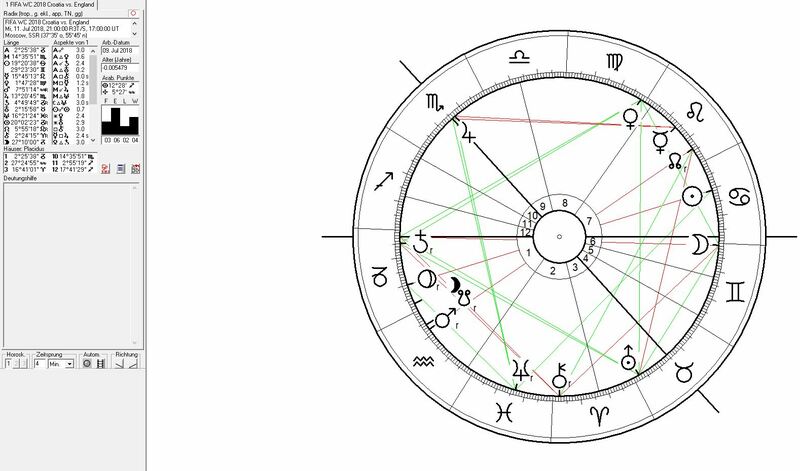 The fact that Uranus as the ruler of the astrogeographical position of Paris at 27°Aquarius is to be understood as a supporting factor for the french national team and capital in the whole torunament. And even more so in Taurus because of the character of France as an country with a strong agricultural basis. 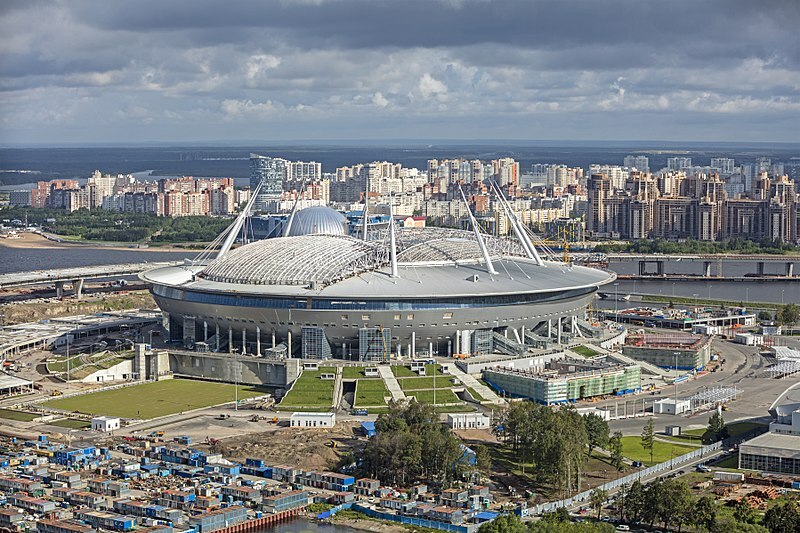 Although both Brazil and Belgium are not qualified yet for the quarterfinals I am convinced that they are going to be playing the match at Kasan on 6 July. And as far as I am concerend I can´t wait to see this match as meeting of the two best teams so far. Except France and Uruguay of course. 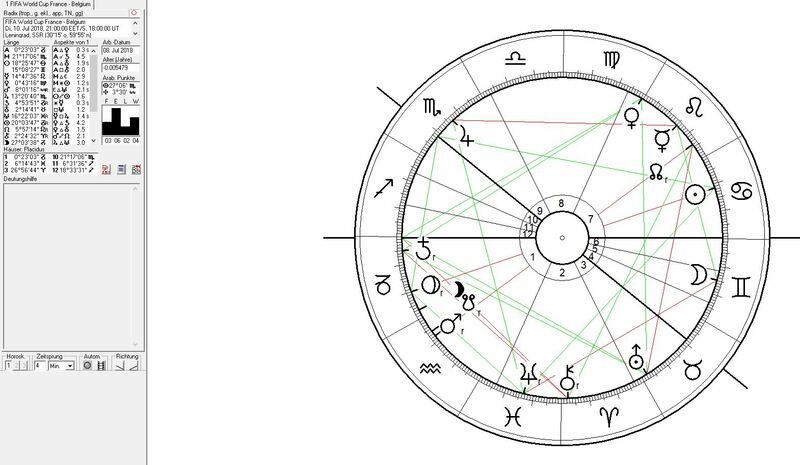 The positions for the 2 capital cities are 25°Gemini + 20°Aries for Brasilia and 8°Scorpio + 22°Pisces for Brussels. As can be seen the Moon will be exactly conjunct the Brazilian capital in what seems a perfect constellation for Brazil – and one that the brasilian team may definitely need on that day. This is because astrologically the success of the Belgian team appears to be organized in such a way that it is dedicated to confronting unfavourable planetary transits and highest pressure from the opposing team with Jupiter at 13°Scorpio conjunct Brussels. but squared by Mars from 8°Aquarius (from their right defense side through Neymar with sun in Aquarius) and also by a conjunction of the South Node at 5° and Mercury at 10°Leo from the left defense side (Willian with sun in Leo). So the pressure on Belgiums defense seems to already be habitual for the players. 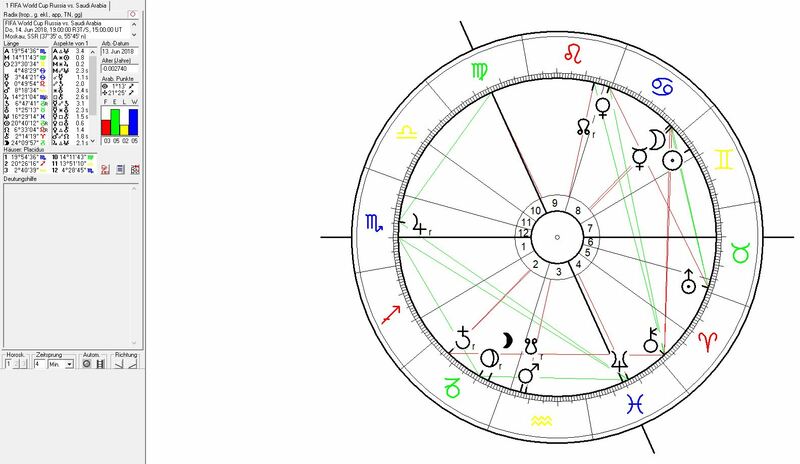 Extremely difficult situations for the the belgian team are to be expected between minute 19 and 28 of the match when the North Node, Mars and Mercury will occupy the Descendant and Ascendant respectively. With the start of the 2nd half of the match with the ascendant moving through Pisces these problematic aspects for the belgian team will cease to be effective and the situation at leat energetically may turn in favour of the belgian team. For comparison. the encounter between Brazil and Belgium on 17 June 2002 in the 2002 FIFA Championships when a regular goal by Marc Wilmots was not given had Neptune at 10°Aquarius square to the Belgian capital. Neptune being the factor of negligence of the rights of the belgian team through the square position to Brussels. First of all I want to repeat my proposal here: I suggest watching the matches as an exchange of information between the morphogenetic fields of nations – and seeing the larger picture of the events, atmosphere, performances and the things that happen instead of reducing astrology`s function to the prediction of the outcome of matches. Uruguay has a tradition for delivering passionate performances during World Cups. The team`s performance against Portugal was magical to see – at least I personally felt so. The coming quarterfinals between Uruguay and France on Friday, 6 July will be another climax of this World Championship which for my taste has delivered some absolutely classical moments so far. The astrogeographical coordinates for the morphogenetic field resonance of the capitals that the two teams represent are: Montevideo at 16°Pisces & 20°Cancer and Paris at 27°Aquarius & 28° Sagittarius. 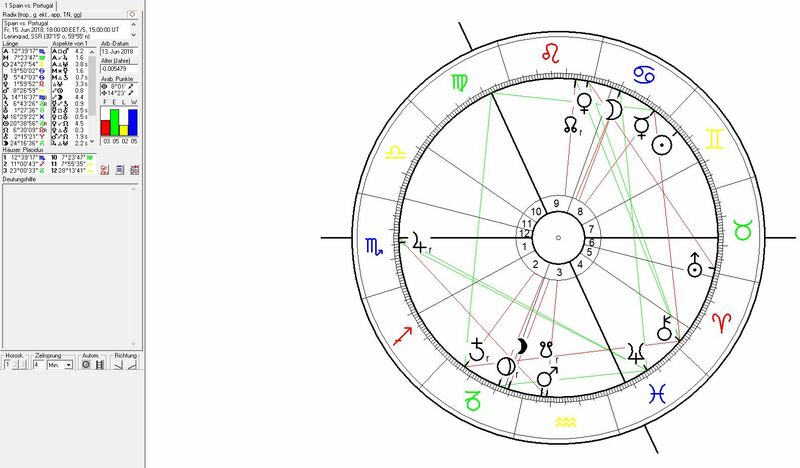 Kilian Mbappe`s birth sun (born 20 Dec 1998) at 28°Sagittarius and conjunct Paris explains the strong support for the french national team by this unbelievably intense player. By the way: french president Emmanuel Macron (born 21 Dec 1977) represents the sun over Paris too. Uruguay was the host and winner of the first ever Football World Cup tournament in 1930 played during Pluto´s transit over the capital Montevideo. 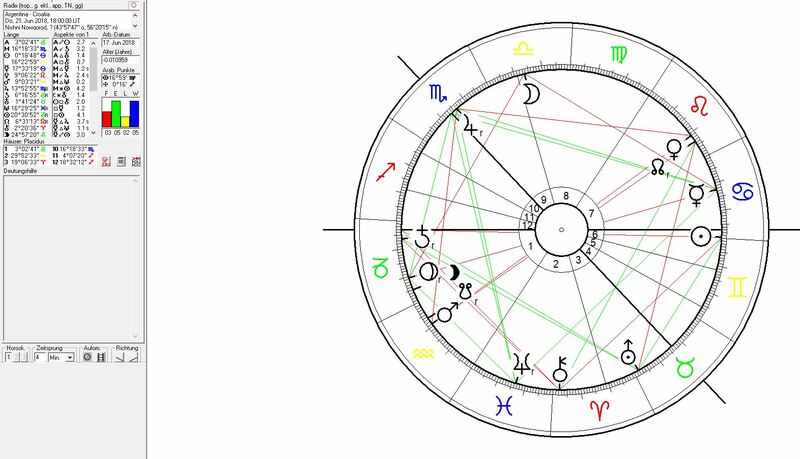 The position of Pluto at 20°Cancer and exactly conjunct the astrogeographical position of Montevideo marked the first ever FIFA World Championship. 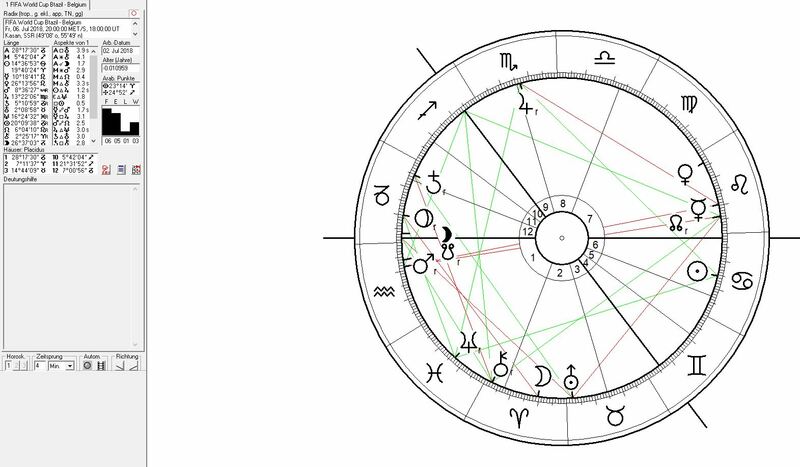 Saturn`s retrograde position at 6°Capricorn in 1930 is now repeated as Saturn is retrograde at 5°Capricorn. in a particularly good omen for Uruguay. The Moon at 17° in highly alert fire sign Aries the sign of action and speed will be approaching the exact square to the 20°Cancer coordinate of Montevideo. As the sign ruler of Cancer this Moon position stands for the danger that the Uruguayan team may cause for themselves by exaggeration or losing control. 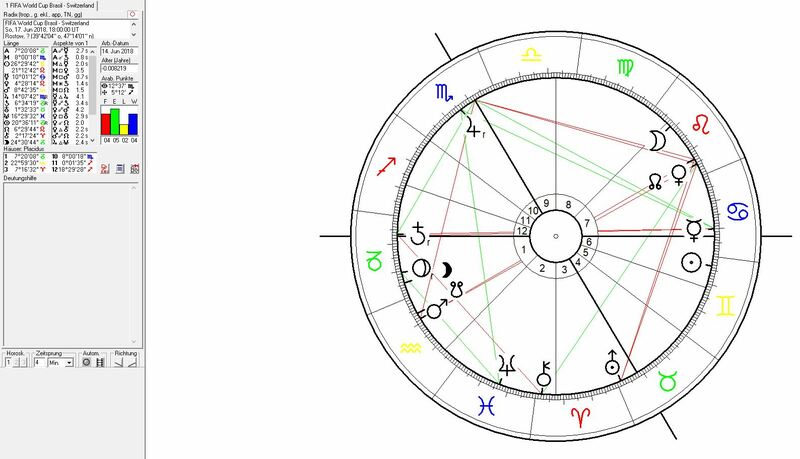 The transit of the Sun at 14° Cancer will be approaching he 20° Cancer coordinate of Montevideo and be in exact trine to the 16°Pisces position at the same time. Therefore Uruguay has highly favourable constellations as long as they will be able to stick to their intuitive knowledge about the importance of tactical knowledge (Pisces). France will be strongly favoured by Mercury and Venus in Leo – though not the astrogeographical resonating sign for Paris but the ultimate indicator of french culture. The Moon in Aries may support the importance of the dominant physical presence of some of the french players through the trine to the half-sum between Mercury and Venus in Leo. The role of Jupiter at 13° Scorpio and in a trine to both astrogeographical coordinates of Montevideo can be understood as an extremely favourable factor for the team that represents Uruguay. 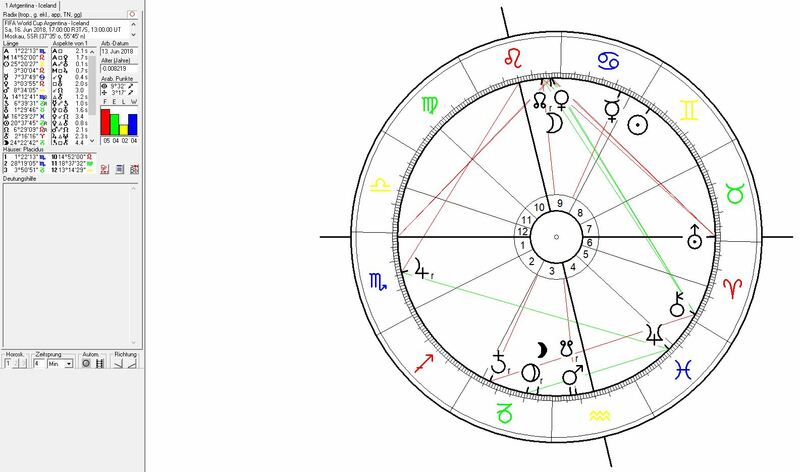 The exchange of information through the morphogenetic field system between Sweden and England during the match on 7 July will take place at a moment in time when the Moon will conjunct Uranus in Taurus the sign of territorial claims and possession of land. That alone suggests a fierceful battle for every little part of the football pitch. This moon position will encounter and activate the decisive astrological factor for the Brexit decision taken during an exact square of Uranus to the astrogeographic position of London explaining the territorial threat to England through the new cooperation of the two superpowers Russia and USA. That alone suggets that emotionally England`s turning away from Europe will be felt and digested through the exchange of energies. As both the Moon and Uranus will be exactly conjunct the astrogeographical position of Moscow (2°Taurus – 12°Cancer) the strong influence of the russian war propaganda on the Brexit decision will have to be felt in one way or other, although it is highly improbable that the Russian authorities will attempt to provoke british fans openly. Anyway the violent clashes between British and Russian fans – with a “triumph” for the russian side – during the 2016 European Championship are unforgotten. There is also another aspect that may come up as an information or topic during the match which is to be understood in relation to the Moon-Uranus conjunction (constellation of feeling trapped and disgusted) in Taurus the sign of money and financial gains. It is the topic of the hypercapitalist system in english football and its extreme financial advantages and dominat role compared to the rest of the world. The emotions having to do with this aspect can not be understood as supporting for the english team players at all, although of course they are in no way personally responsible for that inequality. The resonating astrogeographic positions of the capitals of the two nation that will be confronting each other are 7°Virgo and 16°Aries for Stockholm and 27°Capricorn and 24°Libra for London. This may suggest that the Moon-Uranus conjunction and its trine to Saturn at 5°Capricorn will support the position and performance of the swedish time through a grand trine in combination with the 7°Virgo astrogeographical position of Stockholm. The exact conjunction of Lilith`s position at 27°Capricorn with London astrogeographical coordinate could mean that the british spectators have a deeper unreflect issue to deal with which apparently lies in the unsolved emotional fixation on formalism, the inheritance of monarchy and a classical patriarchical system (last degrees of Capricorn) at the foundation of the country`s self-image. As also Pluto at 20°Capricorn is near the exact square to the 24°Libra position of London at the same time the british team faces an intense pressure on the topics of the national government and background of the patriotic emotionality. As Sweden is traditionally seen under a strong Aquarius influence the swedish team may be understood as working through the position of Mars in Aquarius. In this case the english team may feel the support from the influence from Mercury and North Node and also from Venus in Leo. This resonance is also supported if the english team will play in red (Leo colour) tricots. Altogether the astrogeographical constellations seem to be strongly in support of the swedish team. And most probably the swedish team will need that support simply because of the difference in quality of the swedish player´s individual skills in relation to the highly talented but at least as a national team comparatively unexperienced young british players. But after all the fact Saturn the planet of control over knowledge from experience is transiting in Capricorn the sign of London may support the seriousness of the attempts of british players to control the match. As far as I am concerned I personally support the english team as i see their approach to playing footbal highly positive, fresh and spectacular. Astrogeographical coordinates to be considered for the two capitals are 2°Taurus and 12°Cancer for Moscow and 11°Pisces and 12°Leo for Zagreb capital of Croatia. The resonance between the transit of Uranus the planet of reconnection with the fuller, holistic potentials of aan individual, company, system or country currentlý in transit conjunct the capital Moscow seems to have recoonected the Russian Team with its fuller potentials during the World Cup tournament. And Uranus seems to rule the tournament itself: 70 % of the establishment of the most successful nations in world football have already been kicked out of the competition before the quarterfinals. And the Russia team has played a central role in this revolution with their highly unexpected victory over Spain. Tomorrow night the russian team will be playing out an exchange of energies and information with the croatian team at the olympic stadium in Sochi during a moon transit exactly conjunct the astrogeographical position of Moscow. The Moon as the ruler of Cancer the sign of the second astrogeographical coordinate of Russia in Cancer though a highly supporting transit for the russian capital Moscow may look extremely supporting for the russian team at first glance. This moon transit could support intense identification of the russian people with the capital Moscow, the team itself, patriotic emotions and to some extent possibly even the emotionality of an energetical rebirth and new start for the whole country. But of course the russian team players have to be able to not allow themselves too much mental fixation on the nationwide emotional meaning of the things happening during the match in order to not be distracted from the match itself through the euphoria often triggered by such Uranus transits. Mercury`s transit over 12° Leo conjunct the croation capital Zagreb is an extremely favourable transit for the croation team. Some doubt regarding Mercury as the planet of bets and gambling could be how much of this auspiscious aspect for the Croation team could be swallowed by the infamous croation sport bets mafia – which could energetically undermine the chances of a victory of the skillful and well trained (Mercury) croatian players. 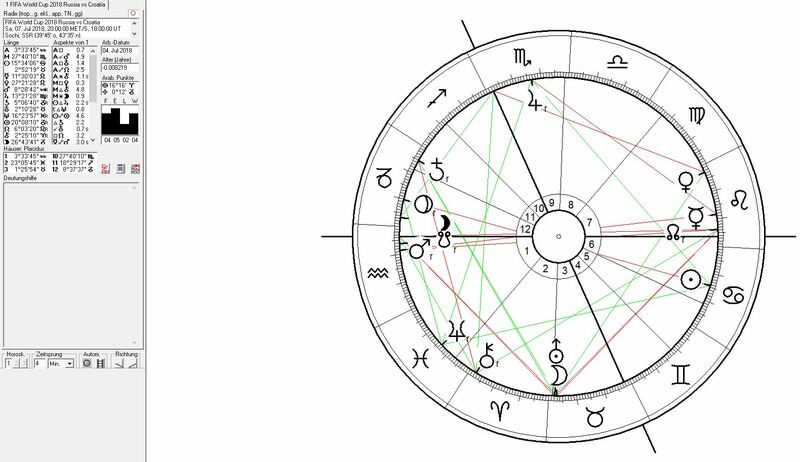 The transit of Jupiter at 13°Scorpio in exact square to the astrogeographical position of Zagreb with mercury on it is a major aspect of pressure on the resonance between the croation team and the capital as a symbol of national unity. 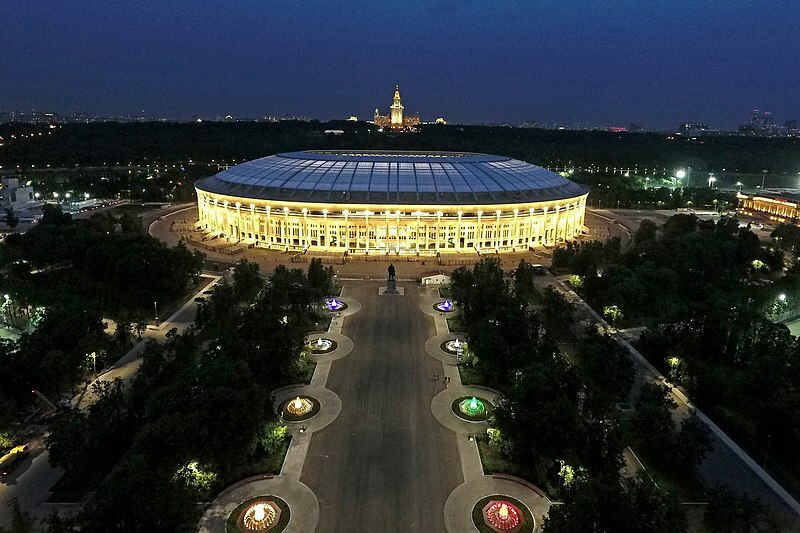 Because of Uranus` transit over Moscow the russian team appears to be energetically related to Mars in Aquarius (Uranus` home sign) during the whole of the tournament. The difference in the roles that the two teams will be playing can best be understood through the opposition of Mars the indicator for the fighting spirit, speed and alertness with Mercury the planet of intelligence and practical skills. The presence of Moon, Mercury und North Node in Leo the sign of french culture reveals the extremely positive constellations that France has for winning this year´s tournament. The Moon will not change signs from Leo into Virgo before 20:31 – which means that France might lose the final if it comes to penalties but has best aspects to win as long as the moon is in Leo . For the astrogeographical coordinates of Paris (27°Aquarius/28Sagittarius) the moon on the last degrees of Leo will not be void of course. Brazil (Jupiter in Scorpio), Spain (Venus in Virgo), Germany (Mars on the South Node in Aquarius) are France´s major competitors in the final. England – one of my personal favourites might have the best team in decades and may be a candidate for the final through support from Mars in Aquarius and Uranus in Taurus. In the final however the Sun at 23°Cancer will be square and in opposition to the astrogeographical positions of London (24°LI & 27 CAP) at the same time making a victory seem improbable. Another top favourite is the team that represents Belgium. For astrogeographical evaluation of the performance of the belgian team consider 8°Scorpio and 22°Pisces as the astrogeographical coordinates of the capital in Brussels. 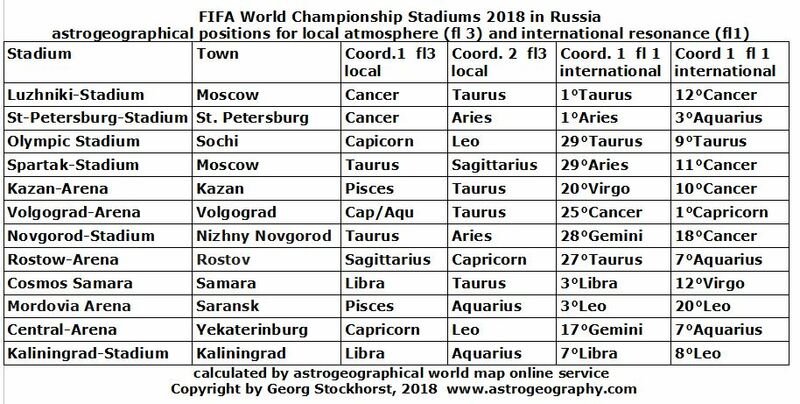 FIFA World Championship Stadiums 2018 in Russia Astrogeographical positions for local atmosphere (fl 3) and international resonance (fl1). Use this astrogeographical data for astrological investigation in sports astrology and for predictions of the outcome of matches and for deeper astrological studies. The positions for field level 3 describe the atmosphere of the twelve sports arenas. For astrological evaluation of these data consider them as indications of the energetical stimulation provided by the construction site. The signs indicate which aspects are supported by the place. Use my astrogeographical worldmap online service on www.karmap.com to get interpretations for a country`s team, team manager or single key players of a team. Or simply call me in my consultation practice in Berlin. The tournament in Russia comes during times of strongest tension and a new climax of the revival of the Cold War after the US government had declared plans to introduce NATO control over Ukraine in 2008 answered by the extensive and highly successful Russian propaganda war promoting a new global neofascist movement and by the illegal occupation of the Krim through Putin`s forces in 2014. Russia the host of this year`s world championship sees Uranus the planet of self-finding moving over the astrogeographical position of Moscow at 1°-2°Taurus during the tournament. It is Uranus` first return to its position during the Great Purge under Stalin during the mid-1930ies which in economical terms was a time of stabilization for Russian economy. To some extent an effect of economical consolidation can be expected in the nearer future (next 7 years). But political self-liberation and/or an end to the russian propaganda war in support of worldwide neofascism is still not to be expected from this transit. These circumstances provide a highly problematic background for the global football party. But like all sports events there will surely be moments in which a higher spirit of the global unity of the people maybe felt by those who have their hearts open and will not be under the spell of neofascist racism and hate propaganda. No other sportly event of the competition of national teams has such a strong global resonance as the football world championships. According to FIFA sources the 2014 FIFA World Cup reached 3.2 billion viewers – one billion watched the final. The opening match sees two highly conflicting countries facing each other. Saudi Arabia as the No. 1 top ally of US strategical foreign policies and also the top supporter of the attacks on the russian sphere of interest in Iraq, Iran, Syria and Afghanistan and top supporter of globalized pseudoislamic terrorism. But the latest development was a new turn in the two country`s relationship through the $3bn arms deal with the consent and apparent mediation of the Trump administration in October 2017. The fact that it is these 2 out of the 193 UN member states that make the start of the tournament is really fascinating. The morphogenetic fields of the 2 nations will confront each other and emotions will be exchanged. Although that may sound naive this event still may be a good chance for a new way of exchange and some stimulation of new ways of thinking between the 2 nations and the conflicting energies behind their flags. 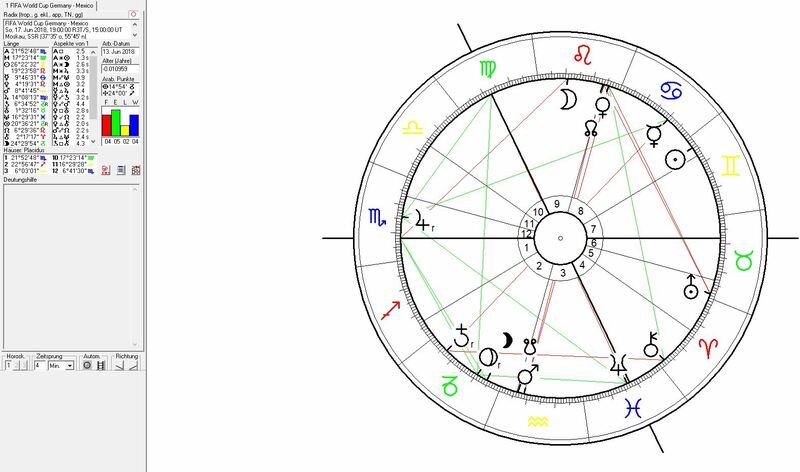 For evaluation of the outcome of the match I recommend to consider the astrogeographical coordinates of the 2 capitals: Riyadh (7°Leo and 21°Leo), and Moscow (2°Taurus and 12°Cancer) reflected in the square transit of Venus in Leo representing Riyadh and Uranus in Taurus representing Moscow. The confrontation of global political issues related to this square transit through the emotions of a sportly battle between these two countries may help the whole world in emotionally dealing with the current tension and in digesting some of the negativity, tension or unfelt issues stored in the common unconscious. Altogether the planetary constellations are highly positive for Saudi Arabia through Venus and the midheaven in Leo – the sign of the Saudi capital. That means that the first half or so may be used to unfold their potentials. But in the course of the match the position of the Leo´s ruling planet the Sun in Gemini and under the rule of Mercury cj. the Moon in Cancer and near Moscow may lead to a situation controlled by the russian team. 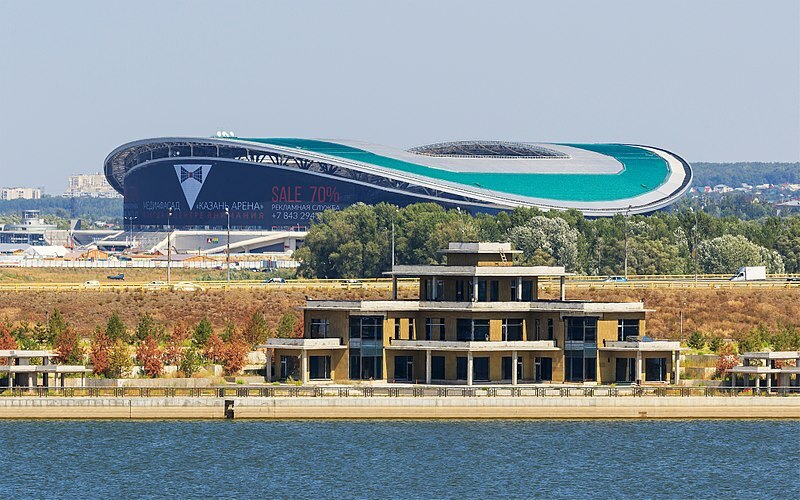 Astrogeographically the position of Moscow (fl1) and the stadium (fl3) in Cancer the 12th sign from the Leo coordinates of Riyadh is to be seen as an extreme challenge for the Saudi Arabian team. The team may be deprived of its royalist status and the base of its nationalistic self-esteem. But such twelvth house constellations do not necessarily have to turn out negative if the team is ready to concentrate on the players on the field and leave the nationalistic background behind. A certain handicap for the russian team may be the threats of doping controls that hang heavily over russian sport. Apart from that a possible hostile interpretation through the referee represented by the opposition from Saturn in Capricorn and in house 2 to the Moon in Cancer. The moon on 20° Cancer will be exactly conjunct the astrogeographical position of the spanish capital Madrid (20°Cancer & 15°Sagittarius) indicating an impressive victory of of the spanish team against their portuguese neighbors. 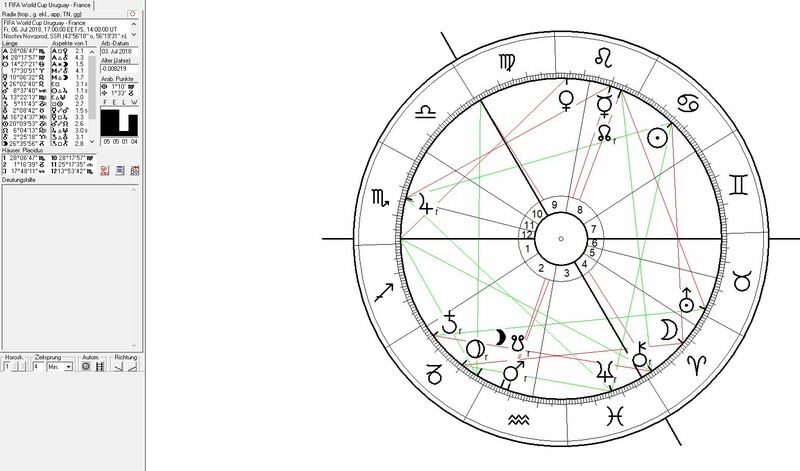 A planetary aspect in favour of the Portugese team will be the trine of Mars from 8°Aquarius to the 10°Libra astrogeographical degree of the portugese capital Lisbon (1°Virgo and 10°Libra) which seems to be currently supporting Christiano CR7 Ronaldo`s constellations with Sun and Mercury in Aquarius. Nobody would have expected Iceland to win a qualification group by beating a heavyweight like Croatia. I personally expect a clear victory by the Argentinian team. But still I have much respect for Iceland and am really fascinated by the clash of such different approaches to playing football. The two capital cities here are Buenos Aires at 21°Cancer and 20°Aquarius for Argentina and Reykjavík at 9°Taurus and 21°Sagittarius for Iceland. Mars at 8°Aquarius will be in a square to Reykjavík indicating the strongest pressure on the icelandic defense by Lo Celso, Messi and Dybala. 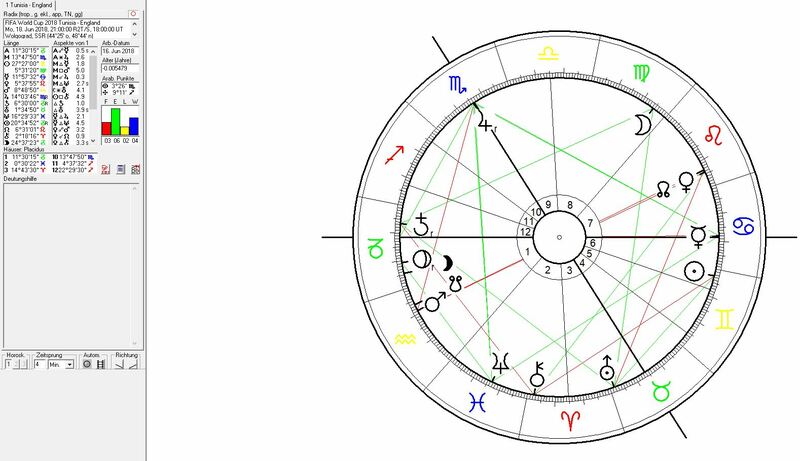 Altogether the Argentinian capital Buenos Aires will still be under heaviest pressure during the tournament and the coming years through the opposition of Pluto to the 21°Cancer position. Politically such pressure is actually highly positive because it supports pressure on the government helping the people to achieve changes and reforms in the political system. But the transit is no doubt not perfect for winning a world championship – at least not during its early stage in 2018. The difiiculties Argentina had during the qualification may be understood as an expression of this Pluto transit. The two capital Cities here are Berlin at 10°Cancer & 29°Virgo and Mexico City at 10°Libra & 13°Sagittarius. Mercury at 10°Cancer will enforce the 10° Cancer position of Berlin in an aspect that may provoke a certain naivity but enough communication and a playful approach with a key role for Hummels and Reus in the german team. At the same time Saturn will be in opposition to Berlin putting stress on the german team from the referee and other factors and also from the mexican team`s defense. Mars` trine to the mexican capital from 8°Aquarius stands for support for intense action and counter attacks trough Mexico´s strikers. Although Venus is moving away from the exact square with Uranus her position is still not as positive for Mexico as it will be in the 2nd and 3rd matches of the group stage. The positions for the 2 capital cities are 25°Gemini and 20°Aries for Brasilia and 29°Aries and 13°Aquarius for the swiss capital Bern. The alertness of the swiss players and their readiness for competition and sudden, fierceful attacks will be supported by Mars in Aquarius near the astreogeographical position of the swiss capital Bern. Jupiter at 13° Scorpio will put the resonance of the swiss team`s supporters and national topics under pressure in a square position from 13°Scorpio. Another interesting constellation will the opposition of the half sum between Moon and Venus in Leo to the swiss capital indicating the battle between the brazilian strikers attacking the swiss fortress from the left and right wings. The Moon at 20° Leo in exact trine can be understood as a constellation of intense support for the brazilian team and single players giving Willian born with sun in Leo and Neymar born with Sun in Aquarius the key roles among the brazilian players in this match. I want to state that personally I`m a big supporter of the english national team since Frank Lampard wasn`t awarded his regular goal against Germany during the 2010 FIFA World Cup and for several personal reasons. The capitals represent by the two teams are Tunis located at 3°Gemini and 18°Libra and London at 24°Libra and 27°Capricorn. The current transit of Mars in Aquarius and in a trine to the tunisian capital`s 3°Gemini coordinate is a supporting factor for the Tunisian capital and a highly positive aspect for the countrys in several ways. The position of the Moon at 5°Virgo in a square to Tunis during the match is an aspect of high tension for the tunisian team, indicating that the teams training conditions, financial potential and other conditions are not perfect. Lilith the planet of unconscious and neglected aspects will be in transit of the astrogeographical coordinate of the british capital all troughout the 2018 tournament indicating a period in which the british capital goes through a process of having to face neglected aspects of its own past and self-image. For the british team this could provide the chance for a real bg change in their outlook and self-image of the “Football England” they represent. I personally have the impression that the young, multicultural and football orientated english team is a really positive and possibly the best possible approach to a successful performance in this year`s World Cup. Players with multinational roots representing neglected aspects of national identity could help the team in not feeling alienated on the European continent – a major problem for english national teams in the past. This is how Lilith`s conjunction with London could be a supporting aspect for the british team. One of the top events during the group stage of the whole tournament will be the matche played between the Argentinian and Croatian teams. The two capital cities here are Buenos Aires at 21°Cancer and 20°Aquarius for Argentina and Zagreb at 11°Pisces and 12°Leo for Croatia. The Moon in the very haeart of Libra the sign of midfielder geniuses, beautiful play and beautiful players may provide the best possible aspect for a match between the superfine players of these tow teams as long as the two teams will not engage themselves in heavy massacres of revenge fouls. Mercury on 17°Cancer will be approaching the astrogeographical position of Buenos Aires supporting improvements in the argentinian play, tactical performance, communication and capacity of finding solutions. As Pluto the planet of profile neúrorsis at 20°Capricorn will be in nearly exact opposition to the capital Buenso Aires througout the whole of the torunament the Argenbtinian team has to deal with severe problems from the apparent invincibilty of its opponent`s defense. A possible solution for that problem may be delivered through the Moon in Libra by supporting the team play instead of projecting too much responsibility on superstar Lionel Messi. Aries the sun sign in Lionel Messi`s birth chart will be under pressure from the square position between Mercury, Moon and Pluto. It is therefore advisable to help Messi unload the profile neurosis of having to fullfill his superior role as the best player on the planet at any moment in any match. The Croatian capital will be supported energetically by the superfine conjunction of heavyweight Venus at 10°Leo with Zagreb`s 12° Leo coordinate during the climax of the group stage and to some extent also during the knockout stages of this year`s tournament. At the same time Jupiter`s square to Zagreb from 13°Scorpio is currently putting the croation capital under intense pressure. There is the chance that this pressure could be unfolded in a positive way if any corruption of political institutions would be openly criticized and a political transformation of nationwide institutions be allowed. As an effect of that the croation team could be energetically supported by this aspect of tension.